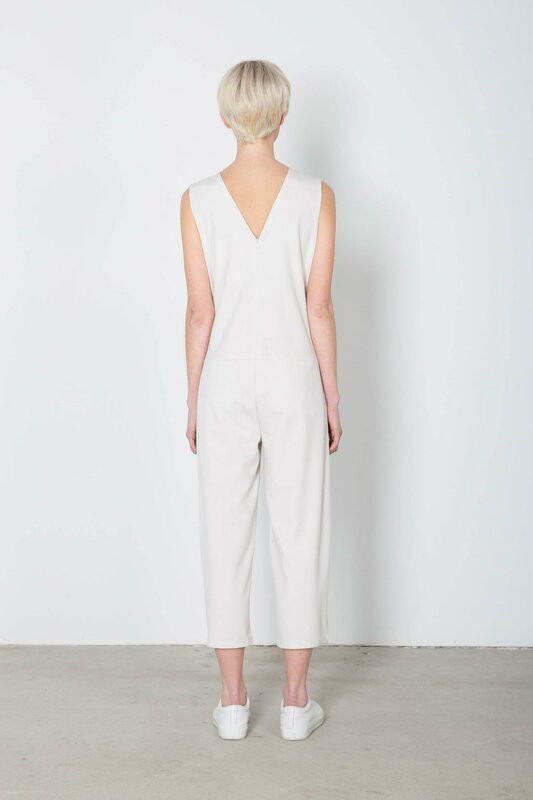 This really minimal jumpsuit combines a comfortable style with elegant detailing. Featuring a shallow V neck line and a slightly lower plunging back with contrasting square front face out pockets. Its fully lined shoulders and chest are breathable so it will carry you from day to evening. Fabric Content: 65% Polyester, 30% Rayon, 5% Spandex Care Instructions: Machine wash cold and lay flat to dry. Cool iron. Fit: Relaxed Approximate Measurements: XS: 34" bust x 21" inseam S: 36" bust x 22" inseam M: 38" bust x 22" inseam L: 40" bust x 23" inseam Model's height is 5'9". Model wears a size small.